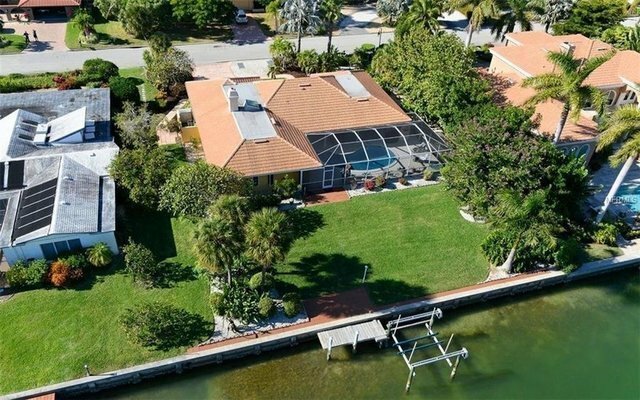 BEST WATERFRONT VALUE ON BIRD KEY! Welcome to some true old Florida charm and discover why Bird Key is on everybody's list! Greeting you with a pavered circular driveway and lush, manicured landscaping, this three-bedroom, canal front home with quick access to Sarasota Bay is ready for you to enjoy. The foyer entry opens up to living, dining and family rooms and immediately lets you catch a glimpse of the canal. Lots of windows and a perfectly placed ceiling light let air and light in no matter the season. Just a few steps from your covered lanai you have 106 feet of waterfront beauty and deep-water dockage. Bird Key Yacht Club with private membership offering clubhouse, restaurant and marina with deep-water slips and fuel, fitness facility, tennis and so much more and Bird Key Park are just a short bike ride away. A quick drive North or South lets you enjoy fine boutique shopping and world-class dining at St. Armand's Circle or Downtown Sarasota. Come by car or boat to preview!